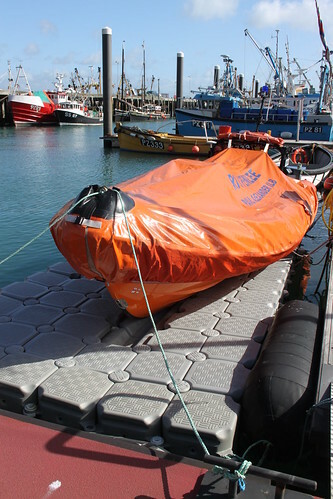 As I mentioned last week, the Penlee Atlantic 75 inshore lifeboat ‘Paul Alexander’ is berthed on a sort of floating pontoon in the harbour, from which she can be launched and recovered quickly and easily. 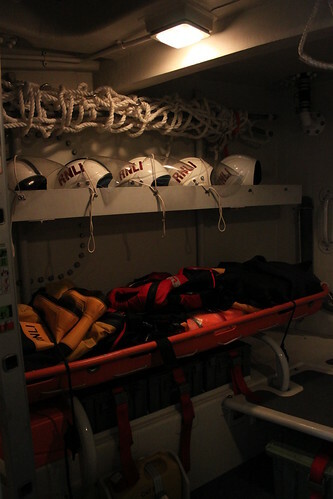 Like all lifeboats of this type, she has a crew of three, a top speed of 32 knots and a range of two and a half hours. She can also carry a whopping 20 survivors. 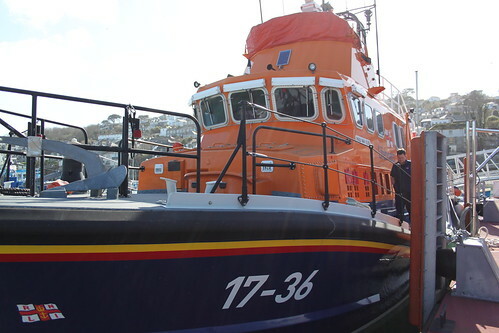 Moored right next to the ‘Paul Alexander’ is the ‘Ivan Ellen’, the station’s 17 metre Severn class all-weather lifeboat. Despite weighing 42 tonnes, she is self-righting and has a top speed of 25 knots and a range of 250 nautical miles. She is powered by two 1,250 horsepower Caterpillar marine diesel engines. For the little guys, who are of course only an inch or so high, the ‘Ivan Ellen’ is even more massive (comparatively speaking) than she is for the rest of us. 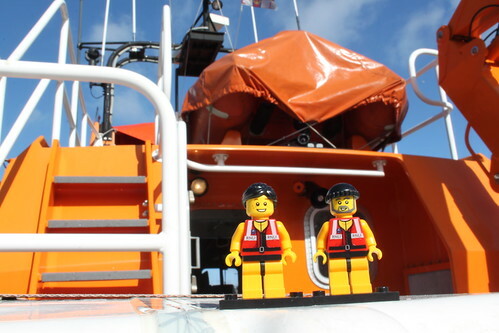 They spent some time standing on the boat’s foredeck, just getting a feel for the immense scale of everything and of the sheer physical bulk of the lifeboat. When the RNLI calls the Severn an ‘all-weather’ lifeboat, they really do mean it. 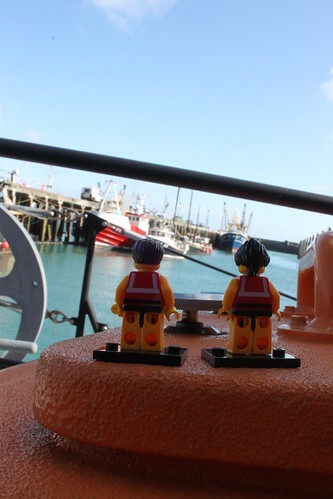 The Crew were also fascinated with the comings and goings in Newlyn harbour. Both literally and metaphorically, the harbour forms the heart of the town of Newlyn, which boasts the largest fishing port in England. If fishing’s not your thing, the town also has a thriving creative arts scene, with an established colony of artists and art galleries. And for the nerdy among us, Newlyn is used by the Ordnance Survey as the datum point for mean sea level. The ‘Ivan Ellen’ carries a small inflatable ‘Y boat’ on her upper deck, which can be lowered into the water using the crane that you can just see on the right of the photograph below. You can also see the upper steering position, which affords improved visibility when looking for a casualty or when manoeuvering the lifeboat alongside. 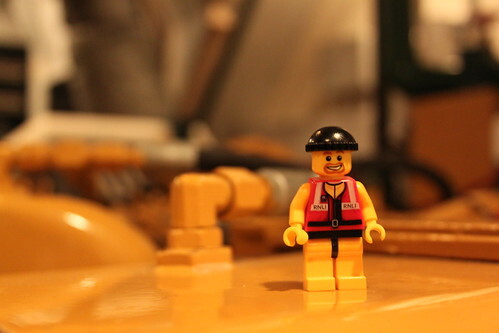 In the main cabin, there are dedicated seats and work stations for each member of the lifeboat’s crew. 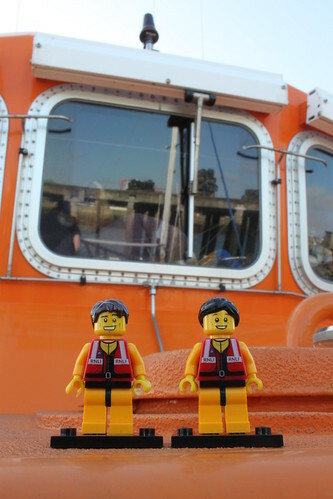 The little guys also met the boat’s own mascots, who have been assembled over the years and are now an established part of the ‘Ivan Ellen’s’ crew. 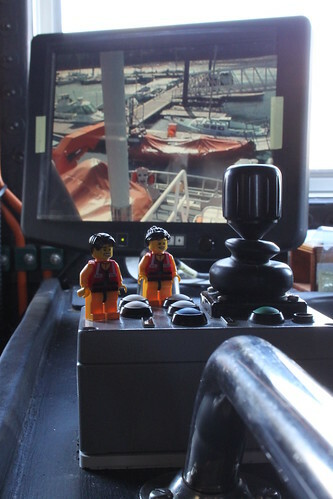 The boat also has a number of CCTV cameras mounted around the side of the superstructure, which can be controlled from within the cabin. These allow the crew to see what is going outside (which is a bonus when the weather is awful and there is rain bashing against the windows) and to record footage for later review. The first thing that they came across was a clean, tidy and surprisingly airy cabin with several rows of seats. 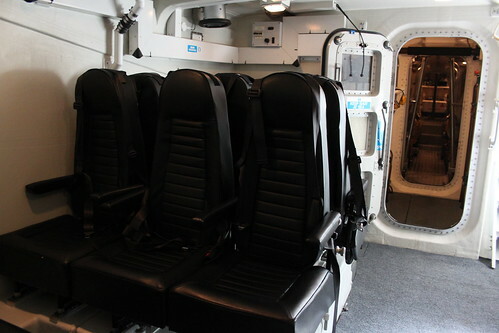 This is the survivors’ cabin, where people that the lifeboat crew have plucked from the water can be kept safe and secure while the boat returns to base. The Severn can take up to 28 survivors without impacting on her ability to self-right, and a massive 124 if necessary. Although she won’t then self-right. And, to be honest, I’m not sure where they would all stand. Everywhere, I would imagine. 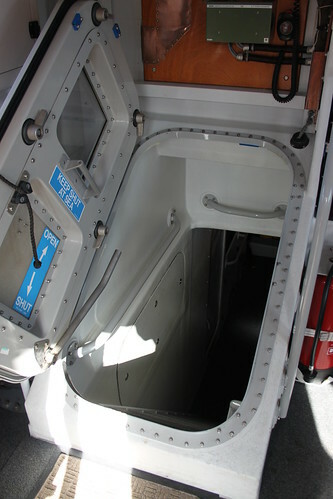 The lower cabin also contains various bits of kit that the crew might need, such as this stretcher, scrambling net and spare personal protective equipment. As you can see, it’s all stored incredibly tidily, so that it is ready for use at a moment’s notice. 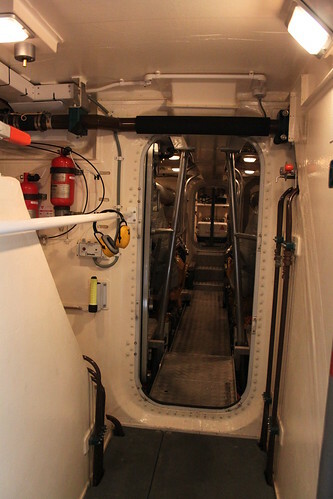 Aft of the survivors’ cabin is a walkway through the engine compartment. This is where the two 1,250 horsepower diesel engines are housed and it really does look the business. Each engine is about the size of a small horse. But, obviously, 1,250 times more powerful. Mechanic Dave was absolutely in his element down here with the engines. He stood there for some time just staring, but thankfully we managed to extricate him before he could tinker with anything. 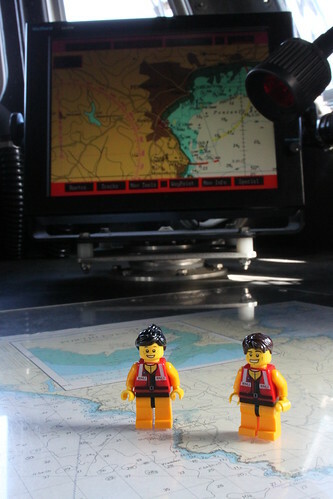 Back in the main cabin, the Crew stumbled upon what is perhaps the most important piece of kit. Yes, its the kettle. 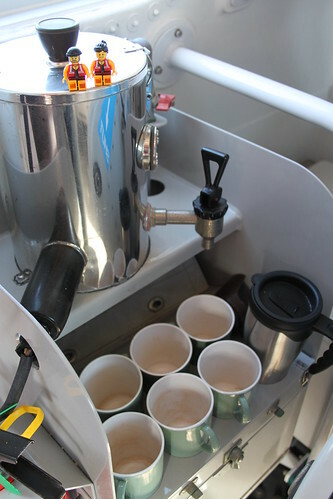 I remember when I was little and used to accompany my Dad on some of his lifeboat inspections, that the highlight of my day was when I was allowed to use the water heater on the boat to make myself a cup of hot chocolate. There were these little ‘maxpax’-type cups with the hot chocolate powder already in them, and all I had to do was peel the foil lid off and (with supervision) add hot water and stir. Mmm… heaven! And that, sadly, brings to an end our tour of the Penlee lifeboats. 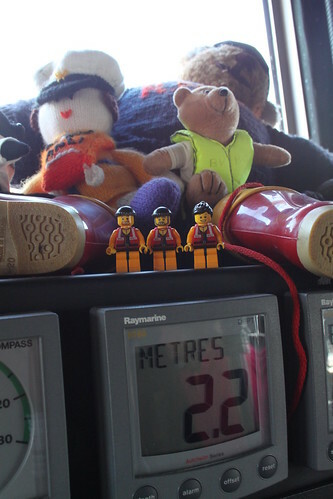 With the little guys by now starting to get a little tired and fractious, we headed back up to the crew room for a quick cuppa with the station’s regular-sized crew before setting off for home. We’d had an amazing time and it had been a real honour to learn more about the Penlee station, its boats and its crew. A massive ‘thank you’ to Patch, Elaine and the crew for making us feel so welcome.